Pardon The Punctuation...Nothing will get me to try a restaurant sooner than when they have a "half off" all the food on the menu special. That's what Lazy Ox Canteen had as a promotion last tuesday night. They're also dog friendly which was another bonus as my dog "Indie" was able to make the trip too. It's in the little Tokyo neighborhood close to downtown LA and is one of the few non-Japanese food options in the area. The only problem with the %50 discount promo is that I gorged myself into a food coma and had trouble sleeping that night because I was sooooooooo full. Alrighty then, lets get to the grub. Pig Ear Chicharrones: with escabeche, tomatillo salsa, and harissa. Like yummy little pig ear french fries. Full of flavor and just a wonderful bite to have a with an ice cold beer. Albacore Ratatouille: with red onion, cucumber, and dill. This was a beautiful, refreshing, and well balanced dish. The dill was a nice touch with the fresh albacore. Moules Marinieres: Mussels and clams with fennel, sundried tomato, and a white wine sauce. This was one of the stars of the show. I have a thing for fennel and for some reason this combination of flavors works for my palate. A perfectly executed dish. Rosemary Beef Ragu: Hand-cut pappardelle with a soft egg and parmigiano reggiano. A little on the heavy side with good flavor. I'm a sucker for ragu and this didn't disappoint. 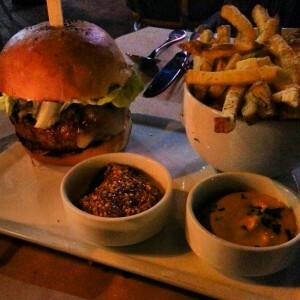 Laxy Ox Burger: with White Cheddar and whole grain mustard. This is a solid burger. Not the best I ever had but still a good choice. Juicy and made with some high quality moo moo. Warm Chocolate Chip Cookie: with hazelnuts and caramel ice cream. Each one of these bad boys are made to order and delicious. Definitely a dessert you can share. House Made Donuts: with chocolate custard and caramelized apple. Fresh, warm, and amazing. This kicks the crap out of your every day donut. 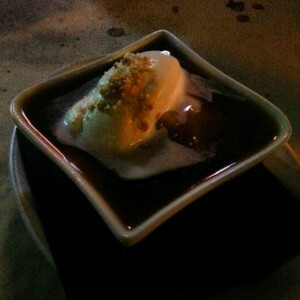 Butterscotch Budino: with caramel and vanilla cookie crumb. This is one of those dishes I'd never think to order but the waitress insisted and brought one out. What a great surprise. Just sinfully good. I'll be back this will be my go to dessert. All in all Lazy Ox Canteen has a lot to offer. Great ingredients paired with great spot on preparation. The prices are a little hight for this place. I kept saying to myself "I love this dish but I can get something similar at blah blah blah for $4 less. Times are tough and money is tight out there so every little thing helps. Would I go back? Yes. I'll just keep my eye out for another night when menu items are discounted. Also guys remember that even when you have a discount like this at a place be sure to tip your server as if you were being charged the full amount for food. So if you got this same discount and your bill was $50 make sure to tip as if it was $100. Enjoy some happy eating!